Reaction 1 takes place exclusively through a [2,3]-rearrangement; the principle evidence is the lack of any crossover reaction. However, the slightly more substituted analogue shown in Reaction 2 gives rise to two products: that obtained from a [2,3]-rearrangement 6 and that obtained from a [1,2]-rearrangement 7. The KIE for the rearrangement of 2 is large for the carbon breaking the bond with nitrogen, while it is small at the carbons that are forming the new bond. This becomes a metric for judging the transition state obtained with computations. With the computed TS and canonical variational transition state theory (VTST) including small curvature tunneling, the KIE can be computed from a computed structures and frequencies. This imposes a range of reasonable distances for the forming C-C bond of 2.6-2.9 Å – much longer that a typical distance in the TS of similar pericyclic reactions. Crossover experiments for Reaction 2 are understood in terms of a reaction model whereby some fraction of the reactants undergo a concerted rearrangement to form 6, and 7 is formed by first breaking the C-N bond, forming two radicals, that either recombine right away or form isolated radicals that then collapse to product. The interesting twist here is that one would expect two different transition states, one for the concerted process 8 and one to cleave the bond 9. Both do exist and are shown in Figure 1. However, VTST predicts that the concerted process should be 25-50 times faster than cleavage, and that does not match up with experiments. Amazingly, molecular dynamics trajectories started from the concerted TS 8 leads to cleavage about 20% of the time using UMO6-2X with a variety of basis sets. Thus, as Singleton has noted many times before, a single TS is crossed that leads to two different products! An argument based on entropy helps explain why the second (cleavage) pathway is viable. Figure 1. UMO6-2x/6-31G* optimized structures of TS 8 and 9. (1) Biswas, B.; Collins, S. C.; Singleton, D. A. "Dynamics and a Unified Understanding of Competitive [2,3]- and [1,2]-Sigmatropic Rearrangements Based on a Study of Ammonium Ylides," J. Am. Chem. Soc. 2014, 136, 3740-3743, DOI: 10.1021/ja4128289. Schreiner provides another beautiful example of the important role that dispersion plays, this time in a biological system.1 The microbe Candidatus Brocadia Anammoxidans oxidizes ammonia with nitrite. This unusual process must be done anaerobically and without allowing toxic side products, like hydrazine to migrate into the cellular environment. So this cell has a very dense membrane surrounding the enzymes that perform the oxidation. This dense membrane is home to some very unusual lipids, such as 1. These lipids contain the ladderane core, a highly strained unit. Schreiner hypothesized that these ladderane groups might pack very well and very tightly due to dispersion. 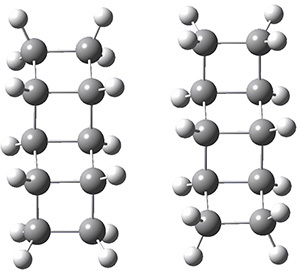 The geometries of the - through -ladderanes and their dimers were optimized at MP2/aug-cc-pVDZ, and the binding energies corrected for larger basis sets and higher correlation effects. The dimers were oriented in their face-to-face orientation (parallel-displaced dimer, PDD) or edge-to-edge (side-on dimer, SD). Figure 1 shows the optimized structures of the two dimeric forms of -ladderane. Figure 1. MP2/aug-cc-pVDZ optimized geometries of the dimers of -ladderane in the PDD and SD orientations. The binding energies of the ladderane dimers, using the extrapolated energies and at B3LYP-D3/6-311+G(d,p), are listed in Table 1. (The performance of the B3LYP-D3 functional is excellent, by the way. 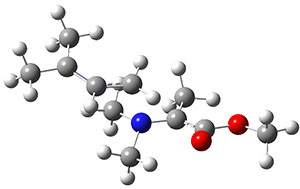 )The binding is quite appreciable, greater than 6 kcal mol-1 for both the - and -ladderanes. Interestingly, these binding energies far exceed the binding energies of similarly long alkanes. So, very long alkyl lipid chains would be needed to duplicate the strong binding. Nature appears to have devised a rather remarkable solution to its cellular isolation problem! Interactions for Compact Membranes Composed of Molecular Ladders," J. Chem. Theor. Comput. 2014, 10, 1353-1358, DOI: 10.1021/ct5000499. Every chapter has been updated, meaning that the topics from the First Edition that remain in this Second Edition (and that’s most of them) have been updated with any new relevant work that have appeared since 2007, when the First Edition was published. In addition, the following new subjects have been included. One of the major additions to the entire book appears in Chapter 5: the discovery of tunneling in a variety of carbenes. This work, pioneered by Schreiner and Allen, led to the discovery of tunneling control, a third means, in conjunction with thermodynamic control and kinetic control, for controlling product formation. This work is an exemplar of the synergy provided by experiments done in partnership with computations. The chapter also includes an interview with Prof. Peter Schreiner. The discussion on proline-catalyzed aldols includes many new computations, especially dealing with the possible intermediacy of oxazolidinones. A section on thiurea-catalyzed Claisen rearrangements, from the Jacobsen group, concludes the chapter, showing how the computational approaches to organocatalyzed reactions can be extended beyond the aldol and aldol-like reactions. 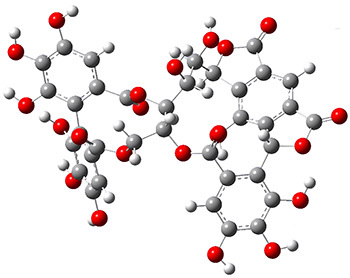 A discussion of solvent effects on amino acid structure has been added. 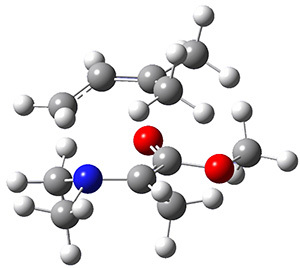 This work focusses on the use of microsolvation to model local solvent effects, particularly in cases where proper accounting of strong hydrogen bonds can be critical in assessing behaviors. A great deal of new materials appears in this chapter. Since the publication of the first edition of the book, many new studies have been published that greatly expand the types of organic reactions that are subject to dynamic effects. Of particular note are the many new examples of reactions on bifurcating surfaces. Some studies, principally by Singleton, now provide some guidance and hints towards predicting what types of reactions might exhibit non-statistical dynamics. Two new non-statistical dynamic types are presented: the roaming reactions and the roundabout mechanism in the SN2 reaction. The chapter ends with a detailed case study of the Wolff rearrangement. The last chapter is entirely new, and features how the techniques of computational organic chemistry, as discussed in the previous eight chapters, can be employed toward explicating enzymatic reactions. The chapter is not an in-depth survey of all of the activities in computational enzyme action – that would require its own full-length book – but rather it’s an overview to inspire you. The chapter begins with a brief discussion of enzymatic models, including the Pauling paradigm and Goodman’s model. Then computational strategies for addressing the large molecules involved in enzymatic studies are presented including QM/MM, adiabatic mapping, and the use of some very large-scale computations as benchmarks. Next, I present two case studies: of chorismate mutase and of catechol-O-methyltransferase (COMT). The chapter ends with a presentation of the progress in de novo design of enzymes capable of catalyzing specific reactions as developed by Baker and Houk. In this and the next post I discuss some of the new materials in the Second Edition of my book Computational Organic Chemistry. Every chapter has been updated, meaning that the topics from the First Edition that remain in this Second Edition (and that’s most of them) have been updated with any new relevant work that have appeared since 2007, when the First Edition was published. What I present in this and the next post are those sections or chapters that are entirely new. This post covers chapters 1-4 and the next post covers chapters 5-9. The discussion of basis set superposition error (BSSE) is expanded and includes intramolecular BSSE. A new section has been added to discuss QM/MM methods including ONIOM. The discussion of potential energy surfaces is expanded, including presentation of more complicated surfaces that including valley-ridge inflection (VRI) points. Lastly, the chapter concludes with an interview of Prof. Stefan Grimme. This is essentially a brand new chapter dealing with how computed spectral properties have been used in structural identification. The chapter begins with a presentation of computed structural features (bond lengths and angles) and how they compare with experiment. Next, I present some studies of computer IR spectra and their use in structure identification. The bulk of this chapter deals with NMR. I present methods for computing NMR with scaling techniques. The statistical methods of Goodman (CP1 and DP4) are described in the context of discriminating stereoisomers. The section ends with five case studies where computed NMR spectra were used to identify chemical structure. Next, computed optical activity including ORD and ECD and VCD used for structure determination are described through 6 case studies. This chapter ends with an interview of Prof. Jonathan Goodman. The main addition to this chapter is an extensive discussion of alkane isomerism, and the surprising failure of many standard density functionals (including B3LYP) to properly account for isomer energies. The work in this area led to the recognition of the importance of dispersion and medium-range correlation, and the development of new functionals and dispersion corrections. Other new sections include a case study of the acidity of amino acids (especially cysteine and tyrosine where the most acidic proton in the gas phase is not the carboxylic acid proton), and two added studies of aromaticity: (a) the competition between aromaticity and strain and (b) π-π stacking. The chapter is updated from the first addition with two major additions. First, a section on bispericyclic reactions is added. This type of reaction is important in the context of a number of reactions that display dynamic effects (see Chapter 8). Second, the notion of transition state distortion energy as guiding reaction selectivity is described. The highlights of the new materials in Chapters 5-9 will appear in the next blog post. Second Edition of Computational Organic Chemistry released! 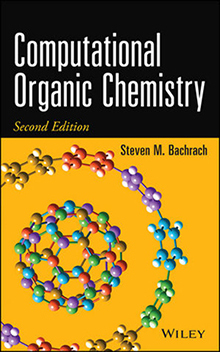 The second edition of my book Computational Organic Chemistry has finally been published. The book is available directly from the publisher (Wiley) or from Amazon. The book contains a lot of updated materials along with a great deal of new sections and chapters. The next couple of blog posts will go into some detail about what is new in the Second Edition. I do want to thank all of the commenters to my blog for their encouragement towards both maintaining this blog service and writing the Second Edition. The many comments helped inform my selections of new materials to include in the new edition. I hope you enjoy the book and as always I welcome any and all comments and feedback! to helium. Then, using infrared predissociation spectroscopy (IRPD), they obtained a spectrum that suggested two different structures. Next, employing MP2/aug-cc-pVTZ computations, they identified a number of possible geometries, and the two lowest energy singlet dications have the geometries shown in Figure 1. 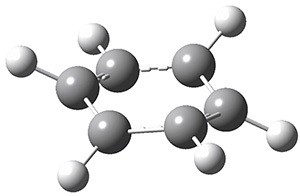 The first structure (1) has a six member ring, but the molecule is no longer planar. Lying a bit lower in energy is 2, having a pentagonal pyramid form. The combination of the computed IR spectra of each of these two structures matches up extremely well with the experimental spectrum. Figure 1. MP2/aug-cc-pVTZ geometries of benzene dication 1 and 2. (1) Jašík, J.; Gerlich, D.; Roithová, J. "Probing Isomers of the Benzene Dication in a Low-Temperature Trap," J. Am. Chem. Soc. 2014, 136, 2960-2962, DOI: 10.1021/ja412109h. To aid in determining the absolute stereochemistry as centers 1’ and A8, the authors employed a computational approach. Conformers of the four diastereomers (RR, RS, SR, SS) were optimized first with molecular mechanics, then the low energy conformers were reoptimized at AM1, and then finally all of the conformers within 6 kcal mol-1 of the lowest energy structure were reoptimized at PCM(acetone)/B3LYP/6-31G(d,p). 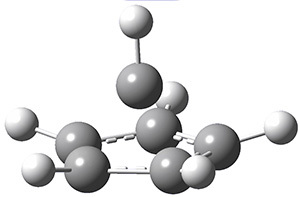 The 1H and 13C NMR chemical shifts for all of the structures that contribute greater than 1% to the Boltzmann population were computed at PCM(acetone)mPW1PW91/6-311+G(2d,p)//B3LYP/6-31G(d,p). The DP4 probability (see this post) identified the (1’S,A8R) isomer with 100% probability for matching up with the experimental NMR spectrum. Additionally, the computed ECD spectrum matches nicely with the experimental spectra for this same stereoisomer. The lowest energy conformer of 1 is shown in Figure 1. Figure 1. 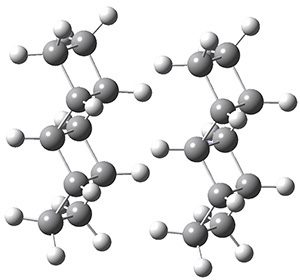 PCM(acetone)/B3LYP/6-31G(d,p) structure of the lowest energy conformer of 1. 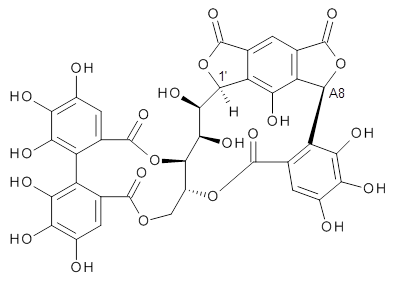 (1) Omar, M.; Matsuo, Y.; Maeda, H.; Saito, Y.; Tanaka, T. "New Metabolites of C-Glycosidic Ellagitannin from Japanese Oak Sapwood," Org. Lett. 2014, 16, 1378–1381, DOI: 10.1021/ol500146a.